Kristina is a board certified nurse practitioner with the American Association of Nurse Practitioners. She serves as Dr. Michael Greaser’s nurse practitioner where she assists in caring for patients with a variety of foot and ankle orthopedic conditions. 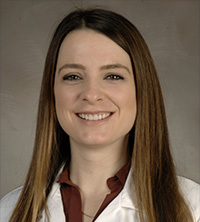 She is skilled in assessing and caring for patients with acute and chronic foot and ankle disease processes, wound complications, and a range of acute foot and ankle fractures. She prepares patients preoperatively and provides postoperative care as the patient progresses through the perioperative process. In addition, she manages the progression of injuries/conditions managed non-operatively. She also performs corticosteroid injections for selective foot and ankle conditions.